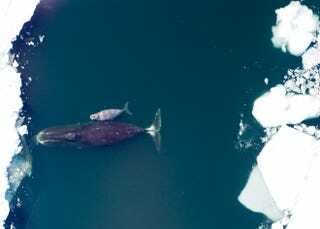 Are Warming Arctic Temperatures Spawning New Hybrid Whales? As Arctic temperatures rise and the ice melts, animals that once had separate migration patterns are suddenly encountering each other — and that could lead to some new animal hybrids. Tim McDonnell over at Nautilus has written a piece about just what the increased interaction between Arctic species could mean. Sometimes it's as simple as increased competition for food or for space, but it can also mean the possibility of new hybrid animals. Incidences of "grolar" — or polar/grizzly hybrid — bears are already pretty well documented, and scientists are also looking into the possibility that a bowhead/right whale hybrid has recently been spotted. Kelly and his coauthors have counted 34 opportunities for hybridization across 22 Arctic or near-Arctic species, based on the animals' genetic compatibility and geographic range. The list includes potential hybrids of ringed and ribbon seals, Atlantic walrus and Pacific walrus, and beluga whales and narwhals. While it's tempting to imagine a strange new Arctic teeming with "grolar bears" and "narlugas," hybridization comes at a cost. Arctic biodiversity will be reduced through gradual consolidation, taking with it a blend of genes that have evolved by natural selection over millennia. "There's going to be a whole bunch of organisms containing genes that we're going to lose," Kelly says. Which genes, exactly, is unclear. A hybrid's success, like any organism's, hinges on its fitness to its environment. Because the Arctic is changing rapidly, it's hard to predict which traits will be most important for, say, a population of grolar bears. Merging features of two well-adapted parent species might help hybrids cope with shifting conditions. But more often than not, Kelly thinks, genetic incompatibilities in hybrids will erase traits crucial to the long-term survival of both parent species. If that happens, he says, "then we can expect a great reduction in those populations, and possibly extinctions." You can read more about Arctic hybrids, and what the future may hold for them, over at Nautilus.